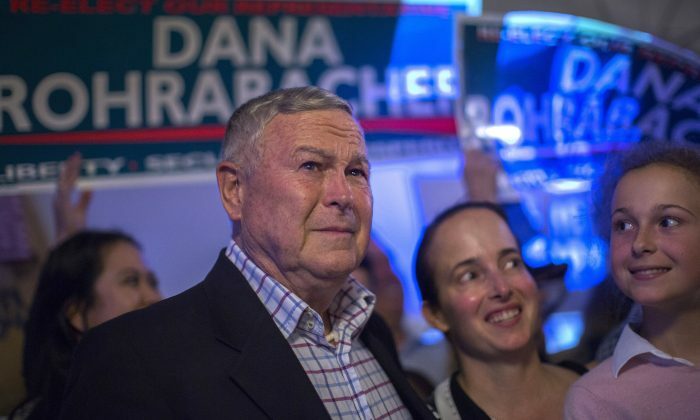 While Democrats fell short of creating a nationwide blue wave in the midterm election, they succeeded in stopping a red wave in the state of California, with the GOP experiencing a number of losses. In a few close races the votes are still being counted, but Republicans lost their campaigns for all statewide offices, possibly five congressional districts, and Prop. 6, the gas tax repeal, which was a major part of the GOP’s focus for the election. The California congressional delegation may only having nine remaining Republican members. This is the first time since 1947 that members of the Republican caucus in the delegation have been in the single digits. However, in 1947 the entire state only had 23 congressional seats, while the golden state now has 53 members. Just an hour and a half after polls closed on the night of the election, Marla Livengood, the GOP candidate for Congressional District 9, and her supporters watched from her campaign office while the Republican gubernatorial candidate John Cox made his concession speech on television. Cox lost his campaign to his Democratic opponent Gavin Newsom with a result of 40.7 percent to 59.3 percent. During Cox’s speech, Livengood’s supporters started leaving her campaign office, even though at the time Livengood was only about three percent behind her Democratic opponent. As a first-time candidate running her own campaign, Livengood was new to politics and did very well in the primary election. She was considered the candidate most likely to win in northern California among those challenging Democratic incumbents. “Whether we win or lose today, we’ve already won. We fought hard and we’ve been really talking to people,” Livengood said. Livengood’s main message to her constituents was that the people in her district were forgotten and not properly represented in Congress on a wide range of issues including affordable housing, transportation, neighborhood safety, and farming. She eventually lost to her Democratic opponent 45.7 percent to 54.3 percent. Richie Greenberg was the GOP candidate for San Francisco mayor in this year’s primary election. “In San Francisco we have such a terrible change now that all the far-left socialists and progressives won,” said Greenberg, who is now the city’s GOP central committee member. Greenberg said all of the independent and moderate Democratic candidates lost their campaigns in the midterm. Based on early available voting numbers, the candidate estimated that out of 33,000 registered Republicans in the city, around 70 percent, came out and voted. Rudy Peters was the GOP candidate for the Congressional District 15 in northern California. Peters won second place in the primary election with 26.2 percent of votes, while his Democratic opponent won first place with 70.5 percent. A nonpartisan candidate took 3.3 percent. Peters told The Epoch Times that only 18 percent of Republicans voted in the primary election. Peters was hoping more Republicans would come out to vote in the November midterm, but he lost 29.9 percent to 70.1 percent to his Democratic opponent. Peters felt that he did a good job reaching out to independents and moderate Democrats, but he wondered how many Republicans actually came out and voted. He is currently waiting for final voting reports from the Secretary of State’s office. Some Republicans in the state have wondered why the GOP base was not entirely mobilized and engaged in such a crucial election. “Republicans in California were handed a massive loss across the state due to failed election strategies,” said Travis Allen, who was one of the GOP gubernatorial candidates in this year’s primary election. The 2018 midterm was seen by many people across the nation as a referendum about Trump’s policies. The Democratic gubernatorial candidate Gavin Newsom labeled himself as the leader of the liberal resistance to Trump, and this strategy seemed to prove effective in California by the results of the election. “Many in the leadership of the California Republican Party saw that President Trump was a liability, and they’ve tried to distance themselves from the most popular Republican president we saw in decades,” Allen said. In the primary election, Allen was the only gubernatorial candidate who supported Trump in 2016. Allen won by an overwhelming 72 percent in the gubernatorial debate hosted by NBC back in May, based on NBC’s post-debate survey. Most of the GOP candidates focused their campaigns on the failed policies of the current Democratic establishment in Sacramento, where Newsom has served as lieutenant governor, instead of voicing support for the Trump presidency. However, to Allen, it’s “about the time to stand out and be proud Republicans again in California.” Allen believes that GOP candidates standing shoulder to shoulder with President Trump would have greatly boosted and mobilized conservatives in the state. While Trump’s presence in the swing states definitely boosted the spirits of his conservative base, many Republicans in California continued to question if Trump’s presence in California would actually help the GOP race. Trump met strong protests when he visited California back in 2016 election, but he did receive about 4.48 million votes there in the 2016 election. Cox received about 3.24 million votes in the midterm election, roughly 1.2 million less than Trump. The total voter turnout in this year’s midterm election was a little over 8 million, while in 2016 it was more than 13 million. Many GOP leaders were also upset about the loss of Prop. 6, a statewide measure to repeal the gas tax. They believed that voters were tricked by the Democratic establishment. Prop. 6, which was considered by many in the GOP leadership as the central platform of their midterm campaigns, was to repeal the gas tax increase approved by the state legislature in 2017. “That is a clear attempt by state politicians to defraud California voters of an honest election on the gas tax repeal by changing the title and putting a false and misleading title on the ballot,” said Carl Demario, the chairman of Reform California, the organization behind Prop. 6. Demario said that all possible actions, including lawsuits, are on the table now for continuing to move forward on this issue. Many GOP leaders are now in the process of regrouping and pondering why their messages were not well received by voters. “I believe California has lots of really good people who really want the government just to be out of their lives, but did not realize that they just voted for lots of things they dislike,” said Mark Meuser, who was the GOP candidate for Secretary of State. “We need to communicate our values to the general public, not just our own supporters,” said Steve Frank, who recently made an announcement about running for chairman of the California Republican Party Committee.